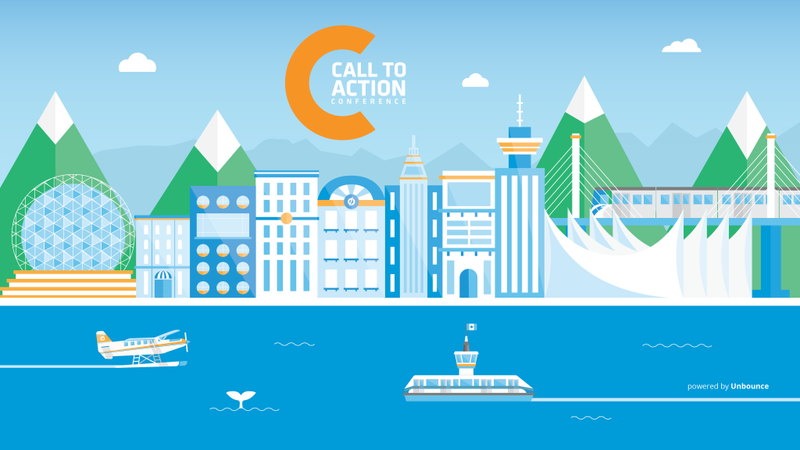 Win A Ticket To Call To Action Conference from Wistia, Cardinal Path, Moz & Überflip! ** Please note this contest is over and all the landing page links in this post are unpublished. When we first announced our conference 3 months ago, we made you a promise: we decided to forego traditional sponsorships (we don’t really believe in them anyway) and said no to booths, exhibitor halls, any type of sponsored content and other parties trying to sell their product. We wanted a relaxed, comfortable, no-pressure environment where you could come to learn. That being said, we know conferences can be expensive when you add up your ticket, travel, hotel, meals, and all those little miscellaneous costs. We hear you! And just because you work for a non-profit, startup, small business, or don’t have the biggest budget, we don’t think it should stop you from learning all you can and meeting a ton of new people along the way. So we took a page from WistiaFest and reached out to some awesome, generous, community-minded, companies (friends) who care about CTAConf and think conversion, landing pages and improving your marketing is important for your business. Create & publish a landing page in Unbounce (it’s free) and tell one of our partners why you want to attend Call To Action Conference! You don’t have to create a flashy, lengthy landing page. You can start from a template or just piece together a page from scratch. On your page, answer one very simple question: why you want to go to Call To Action Conference. Show your enthusiasm & excitement and you’ll be well on your way. Then tweet your landing page to any one of these awesome companies (or all four – individually) and tell them how much you love them. You can tweet one of these companies, or you can tweet all four. The more tweets the merrier! You have until Wednesday, August 27th at 5:00 pm PDT to tweet us your page (we extended the deadline by a few days). We’ll announce the winners the shortly after. If you’ve already purchased a ticket, no worries. If you win, we’ll give you a full refund and you can give your spare ticket to someone you really like. This is ONLY for a ticket to Call To Action Conference. Winners will be responsible for getting themselves to Vancouver and finding a place to crash. Before you start building your landing page, get to know some of our awesome friends who are sending 14 of you to CTAConf and why they’re excited to send you to Call To Action Conference. Wistia is sending 5 lucky people to Call To Action Conference. Check out how you can win tickets here. Moz is sending 4 lucky people to Call To Action Conference. Check out how you can win tickets here. Cardinal Path is sending 3 lucky people to Call To Action Conference. Check out how you can win tickets here. Cardinal Path has helped thousands of marketers — from self-taught sole proprietors to Fortune 500 brand veterans — amass the skills, knowledge and confidence to propel their businesses forward using data-driven marketing tools. They’ve also helped our own customers digest Google Analytics and have helped our blog readers better understand how to create and optimize their PPC campaigns. If there is one thing Cardinal Path is serious about, it’s Analytics and Adwords – just check out their upcoming Analytics & Adwords training courses. Described as “analytics ninjas” by Forrester Research, they are serious about data-driven marketing, so it was a no-brainer that they care about conversions, landing pages and ultimately, the Call To Action Conference. They’re just as passionate about better educating marketers and business in the complex ways of online marketing, so this partnership was a match made in heaven. Uberflip is sending 2 lucky people to Call To Action Conference. Check out how you can win tickets here. There you have it. 4 great companies. 14 Call To Action Conference spots up for grabs. We look forward to seeing your landing pages and tweets. Good luck! PS – If you or your company is interested in sponsoring a few Call To Action Conference attendees, we’d love to hear from you! Please email Stefanie at ctaconf@unbounce.com.